Continuing on into his sophomore season, Finley started all 13 games at tight end. On October 6, 2007, Finley broke the school record for receiving yards by a tight end in a 28-21 loss against Oklahoma when he caught four passes for a career high 149 yards. He finished the season with 45 receptions for 575 yards and two touchdowns. His performance earned honorable mention All-Big 12 Conference honors from the league's coaches and media. 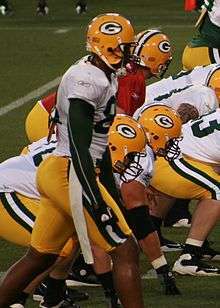 Finley was drafted by the Green Bay Packers in the third round of the 2008 NFL Draft. He battled Tory Humphrey in training camp to be the Packers' No. 2 tight end. Finley eventually won the battle with incumbent veteran, Donald Lee for the starting Tight End position. Finley started the 2011 season off strong, catching three touchdowns in a Week 3 divisional match up against the Chicago Bears. Despite key drops late in the season, Finley still finished 3rd amongst tight ends in receiving touchdowns and 12th in terms of yards. After the 2011 season, Finley became a free agent. On February 22, 2012 the Green Bay Packers re-signed Jermichael Finley to a 2-year $14 million contract. Finley was set to make a little over $5 million in 2012, and around $8 million in 2013. In week 7 of the 2013 season against the Browns, Finley suffered a bruised spinal cord. He has two daughters and a son who all live in Texas with their mothers, as well as two sons in Green Bay. He is raising his sons, Kaydon and London, with his wife Courtney. 1 2 3 4 5 "Meet Texas' signing class of 2005". February 2, 2005. Retrieved September 24, 2013. 1 2 3 "Jermichael Finley". Scouts.com. Retrieved May 21, 2012. 1 2 3 4 5 "Green Bay Packers:Jermichael Finley". Green Bay Packers. Retrieved May 21, 2012. ↑ "2007 All-Big 12 Football Awards Announced". Big 12 Conference. November 27, 2007. Retrieved May 23, 2012. ↑ Halliburton, Suzanne (January 8, 2008). "Finley bolts Horns for shot at NFL – TE is second high-profile offensive star to leave team in as many weeks". Archived from the original on 2008-01-09. Retrieved 2008-01-08. ↑ "Packers see potential in young TE Finley". ↑ "Taking a moment to adjust". ↑ Seinfert, Kevin (January 11, 2012). "More milestones from Packers-Cardinals". ESPN. Retrieved 8 November 2010. ↑ Seinfort, Kevin (October 19, 2010). "Jermichael Finley goes on IR". ESPN. Retrieved 8 November 2010. ↑ "Pittsburgh have showed me a couple deals, but we all know the money ain't what it's supposed to be", Finley said in July. "If I quit the game right now, I can take tax-free money, and that's a difficult thing that I'm going through with myself …"
↑ "Jermichael Finley retires from NFL; hadn't played since 2013 injury". ESPN. 19 October 2015. Retrieved 19 October 2015. ↑ "TE JERMICHAEL FINLEY #88". ↑ "Texas A&M-Texas a sibling rivalry for Lane, Finley". ↑ "Blue Ribbon Preview: Houston". ESPN. Retrieved 7 July 2012. Wikimedia Commons has media related to Jermichael Finley.